You’d be amazed to hear how many people live with food allergies these days, including a very large number of children with gluten intolerance. The good news for mums, however, is that there is an increasing selection of healthy kids’ gluten-free snacks on the market. The good news for moms, however, is that there is an increasing selection of healthy kids’ gluten-free snacks on the market! There’s nothing new about gluten, of course – we’ve been consuming it in huge amounts throughout the world since the Bronze Age (or even earlier). A completely natural product, it seems harmless enough yet, to around 1% of Americans, it can cause all types of health disorders, including indigestion, rashes, chronic fatigue, headaches, nausea, even depression. For some, it can be a minor intolerance, but for least 3 million Americans, it’s a case of living with Celiac Disease (CD) for the rest of their lives. 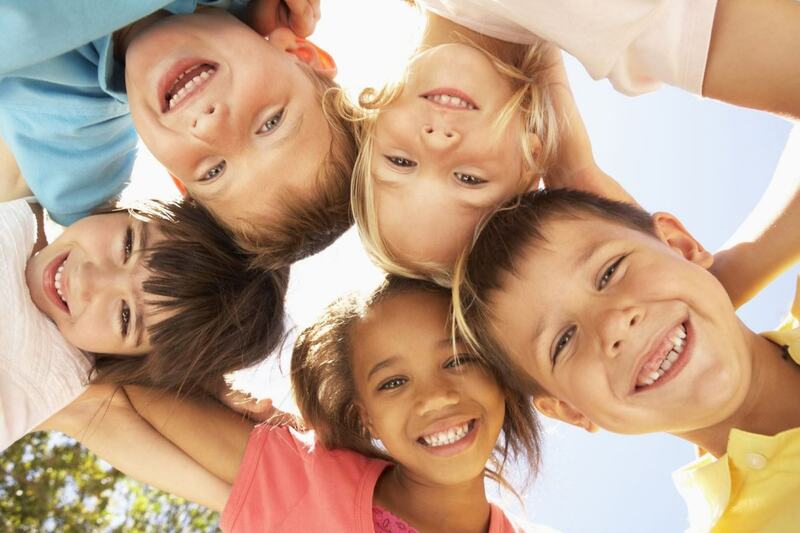 You want to protect your child’s health while giving them treats they love! Read on for the best kids’ gluten free snacks guaranteed to please. CD is an inherited, autoimmune disorder in which proteins from the grains wheat, rye, and barley (gluten) damage the small intestine. It affects one in 100 people worldwide. The only treatment is a lifelong gluten-free diet. And while this can be tricky for grown-ups, it has, until recently, been incredibly hard for children. We know children love to snack – and we know they can be fussy eaters. And generally, the foods that do appeal are gluten-based, such as cookies, chips, pizza, even chocolate bars. Telling them they can have an apple instead doesn’t always go down that well! Historically, 77% of gluten-free consumers said it was hard to find tasty gluten free foods. While fresh fruit and vegetables are a crucial part of a child’s diet, whether they have CD or not, there are now some additional ways of tempting their appetite with other gluten free treats. This is a great idea, and so quick and easy to make at home. Choose a selection of healthy, gluten-free ingredients, such as nuts, dried fruit, pumpkin and sunflower seeds, and shredded coconut. Mix them together and store in an airtight container in the fridge. To make it extra special, you can even add gluten-free chocolate chips! NOTE: this is clearly not suitable for anyone with a nut intolerance. Rice-based products are often a good choice for CD sufferers, and there are quite a few on the market now. A quick and easy snack, that is both tasty and nutritious, is rice cakes with a yummy gluten-free dip. Mix it up a bit by also serving raw veggie sticks or fresh fruit. If your child can eat peanuts, this easy no-cook recipe is a winner. You can mix together peanut butter, craisins, gluten free chocolate chips and gluten free crispy cereal, roll into small balls and refrigerate! These will store well in the fridge and are packed with goodness. All kids love chips, right? But many mainstream products are unsuitable for a gluten-free diet. Sweet Potato Crunchies are a great idea, and all the family will love them. Simply peel a sweet potato and cut into julienne strips. Drizzle with olive oil or unrefined coconut oil, mix well and spread over a large cookie sheet. Bake for about 30 minutes in a medium oven until crisp, and allow to cool. If you’re after something a bit more substantial, try Gluten Free Crostini with Prosciutto and Grilled Peaches. Grill the peach slices until warm and marked with grill marks and set aside. Toast slices of gluten free crostini and spread with goat chevre or dairy free cream cheese. Top with slices of prosciutto, peaches, and drizzle with honey. Delicious! Did you know that most commercial fruit roll ups are full of high fructose corn syrup, artificial dyes, and unnatural flavorings? The good news is that making your own is easy! Just place 4 cups of strawberries (or other fruit) in a food processor with 4 tablespoons of your preferred sweetener (optional). Blend until smooth and add half a cup of water. Put the mixture in a saucepan and simmer for 10-15 minutes. Lightly spray a large cookie sheet with coconut oil, and spread with your fruit mixture. Dehydrate for 8 hours in the oven at 140 degrees. And, of course, if time is of essence fresh fruit wins every single time. Wouldn’t it be great if you could just buy a healthy gluten-free snack off the shelf, that was both affordable and loved by your kids? You can! 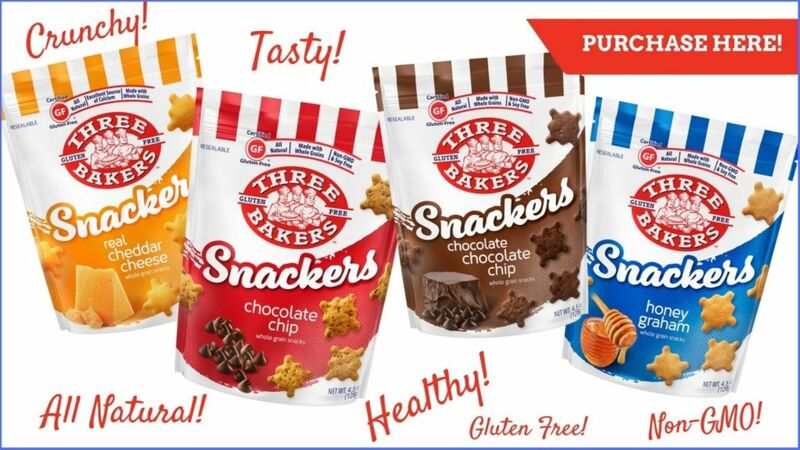 Snackers are a great new product from Three Bakers, and it seems kids just can’t get enough of them! Not only are they gluten free, Snackers are also nut free, egg free and soy free. Snackers were developed to rival popular mainstream snacks that contain gluten, so they are perfect for those who feel like they’re ‘missing out’. And they are available in four delicious flavors – Real Cheddar Cheese, Honey Graham, Chocolate Chip, and Chocolate Chocolate Chip. Not only are Snackers delicious, but healthy, too, as they are certified gluten-free, made with all natural ingredients and whole grains, and non-GMO. Finally, we are seeing gluten free products that provide real alternatives to mainstream products; products that are healthy, delicious, affordable and accessible. Because here’s the thing, you don’t have to have CD to enjoy these products. Many people choose gluten-free diets because they believe it is a healthier way of eating. Around 1.6 million people in the US, who are not diagnosed with CD, are now believed to follow a gluten-free diet. Some people choose a gluten-free diet because wheat, when converted to sugar by your body, can cause problems with inflammation. One thing is indisputable – if you are including more fresh fruit and vegetables, rice products, nuts, and seeds – not to mention Super Foods like quinoa – in your diet, you will definitely be healthier. There are some great gluten free support groups out there, where you can chat with other moms, and those who have CD, and share ideas and recipes, and there are many sources of information for parents of children with CD.